Borrowing from an order a commander might give as they direct the course of their ship, steady as he goes describes how Basty is doing. Walks have been short, and visits with canine pals kept subdued. He gets carried up/down stairs, and is not allowed to jump onto or off of anything. I am not sure if he is more bewildered by it, or just enjoying this new royal status..!! Administering his medication (Gabapentin) twice daily, has been a challenge. Anyone who knows Basty, knows that he is a very picky eater. Historically, I have always asked for meds in liquid form because Basty just won’t swallow a pill. Unfortunately, there is no liquid alternative to Gabapentin. I have tried the pill-popper with zero success. I have resorted to pushing the pill to the back of his throat with my fingers. He pretends to have swallowed the pill, and as soon as I release his mouth, he spits out the pill. After the second or third try, he finally swallows. The key is to get him to swallow before the gel coating dissolves in his mouth as the med is very bitter. I think I am getting better at it. This morning I set up to give him his breakfast, and fed him some before I tried to give him the pill. I then placed the pill in the back of his mouth and he swallowed right away. I am hoping that the lure of a waiting meal or treat will be the key..! One of the possible side effects of Gabapentin, is Ataxia… loss of coordination. I am not sure if he is showing signs of ataxia, or if it is because of the pressure on his spinal cord due to the ruptured disc, but he does waiver somewhat in his hind quarters. I have also noticed some unsteadiness on his front legs. I will identify this to the neurologist. I take him in to Canada West for his disc surgery tomorrow (Thursday). He needs to be there by 8:00 in the morning. The surgery is scheduled for 10:30. I am worried about how much pain he will be in post surgery. But I am encouraged to know that the surgery is fairly routine, and recovery is fairly quick. It will mean a couple of weeks of keeping him off of his feet (short bio breaks only), and then four to six weeks of very low key walk breaks. 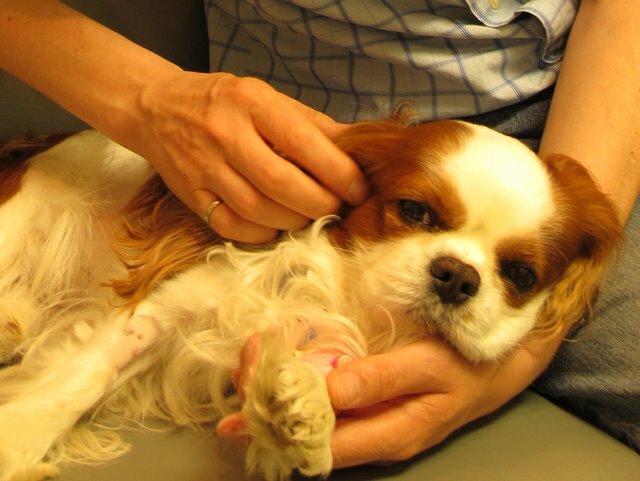 Dr Tim Andrews of CBVC call me on Saturday evening to chat about Basty’s condition. His fax machine was loaded with items from the Langley Emergency and from Canada West. The final diagnosis was not yet included, so I explained what Dr Higgins talked about wrt the MRI results, and the pressing concern regarding Disc surgery to eliminate the rupture that is pressing on his spinal cord. Dr Andrews gave me a run down on what is involved with Disc surgery… essentially, the gel inside the Disc is removed and the vertebrae has bone shaved off in the area of the Disc. The muscle and tendons in the area are sufficient to support the spine. The fibrous material of the Disc is left in place to provide padding between the vertebrae, and the shaving of the vertebrae bone prevents the vertebrae from rubbing together. Saturday night, Sunday, and Sunday night have seen me catering to Basty, hand and foot. Trying to keep him from being too active, but he is a dog after all. He wants to go for a walk, but I need to limit them, and he is not happy about it. His restlessness at night is keeping me up. He has problems finding a comfortable position, and has obvious discomfort. I also need to take him out for a pee in the middle of the night to ensure that internal pressures don’t irritate his spinal condition. Of course, stairs are out of the question, so I am his ‘elevator’ any time we need to go up or down. He is on a drug called Gabapentin to address his pain, typically prescribed for neurological issues. Recovery from Disc surgery is a 6 to 8 week process. The surgery is quite common, and has a high success rate. The first couple of weeks require that activity be kept to a minimum. Soon he will be back on his feet, with short walks on the menu. Just need to keep him subdued, and avoid any excitement. Had to take Basty into the emerg just minutes after Andrea dropped Ginger off. Seems spinal issue has escalated. Requires MRI… possible operation… [planned to] see Dr Tim at CBVC tomorrow. Was on my way back home… 3/4 of the way, he had trouble breathing… Rushed him back to the emerg … 1/2 way there he deficated on my lap… didn’t stop as breathing was getting worse. Am now at the emerg… he is in the back w/ the doctor [Dr Chris Collingwood]. So, I am back home now. Had to leave Basty at the hospital. His tongue was turning purple by the time I returned to the emergency. They tried to get a Neurologist to see him but were unable to make contact. They will be doing a number of tests/blood work/etc in prep for a possible operation. He is currently on oxygen therapy, with the distinct possibility they may need to sedate him and put in a breathing tube. Quick update… Basty has been on oxygen all night; his breathing has improved, his heart rate is down, and his temp is down. The Dr [Sue Whitley] on the late shift seems to have changed their focus from a possible spinal issue to what I brought him in for in the first place… gastro intestinal… my original complaint was that he was arching his back, was walking funny, and appeared bloated. I am of the ‘less educated’ opinion that the first vet dismissed those symptoms way too quickly, and that is what led to the breathing episode. The late night Dr [Whitley] pumped his stomach of its contents. She indicated he was getting a lot of air is his stomach from all the gasping he was doing, and that resulted in some foaming in the stomach (although the gasping was not part of his original symptoms). She gave him diuretic, and he urinated with no issues. She does feel that the gastro intestinal issues and the possible neurological issue may be related. I will go back in to see him at around 10:00. At that time we will evaluate if he is OK to transfer to [Canada] West (the drive is about an hour, through traffic, so need to be sure he is breathing OK on his own). At [Canada] West, they will do an ultrasound, and a Neurologist will look at him (possible MRI). Quick update… Basty is stable, and breathing OK outside oxygen cube. Transported him to [Canada West] via ambulance. Lots of tests to be done over the next couple of days. A number of possibilities arise but I won’t comment till we know more. He is scheduled fou ultra sound, MRI, and possibly CT… for starters. Didn’t sleep at all last night… hoping the fatigue will kick in tonight. Ginger and Misty are OK, but feeling neglected… had to leave them alone last night and all day today. More when I know more. Went to Canada West and talked with the Radiologist [Dr Trevor Enberg]. The Ultra sound came back indicating healthy internal organs. The only concern was a slight narrowing at the base of his airway. [N.B. I suspect that the pain Basty was in during the episode, and this narrowing of the airway, was the reason for the respiratory arrest he experienced]. Update… I don’t have all of the details… have an appointment w/ the neurologist [Dr Michael Higgns] tomorrow morning. However, I did chat with him over the phone this evening. 1) In a nut shell, the most immediate concern is Basty’s mid back, which is what appears to be causing the most problems. The MRI showed that he has a couple of slipped disc’s, one of them appears to be ruptured. The ruptured disc is what is causing his partial paralysis. 2) my worst fear… a second MRI scan of the neck/scull indicates that he appears to have syringomyelia. Given he has had no outwardly visible signs to this point (7 years), I can only hope it is a minor case that can be managed for the short to mid term. 3) they checked his airway, and although it appears to be narrowing closer to the lungs, they don’t think it is too serious. Will need to be very careful about getting him too excited as this can lead to collapsing of the airway. I plan to see him this evening. The neurologist has scheduled him for surgery tomorrow to remove the ruptured disc. When I see him in the morning, we will make the decision to proceed or not. I am not sure I see an alternative. Oh, that is horrible. The poor guy, he must have been in such pain. I don’t know what to say, but that is horrible. Both his parents are now 11 and appear totally normal, as do any of the offspring that I have heard of. I have both a son and daughter of Bailey and Tiff. Do they know the cause of the airway restriction? That is so strange. Best of luck and thank you for keeping me informed. I saw Dr Higgins this morning. He showed me the MRI scans. The ruptured disc is very apparent, and is definitely pinching his spinal cord. We talked about the syringo, and he showed me how the cranial fluid has made pockets in the spinal cord in his neck. There is also some protrusion of brain tissue from the hole in the back of the skull. He has likely had it since he was young, but just never showed any outward signs… this is not unusual. The dragging of his front paws and the quivering of his front legs is likely the first outward sign, and possibly an indication of some progression of the disease. At any rate, the more pressing concern is the ruptured disc. Basty was supposed to have an operation to remove the disc, this afternoon. Unfortunately, another more urgent case where paralysis was a serious factor, came up. So Basty got bumped as he is stable and his condition is manageable. I have taken him home, and will try to keep him subdued for now… his operation is now scheduled for Thursday. As this blog is about life with Basty, I thought I would start by using a post title that resonates with the relationship between Basty ‘n Me. 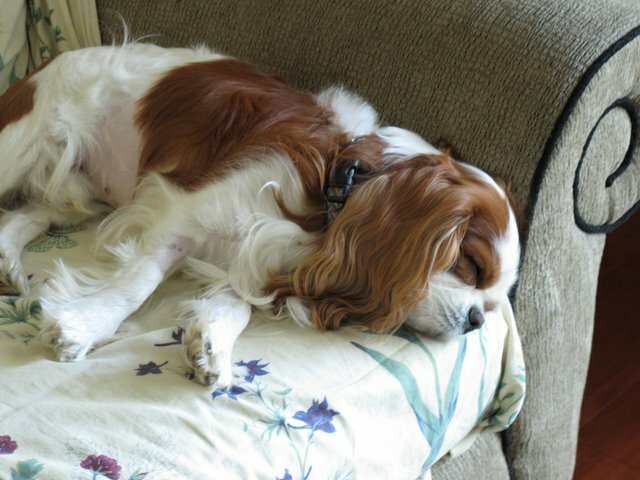 Bastian is a 7 year old Cavalier King Charles Spaniel, born June 26, 2003 to Breeder Karen Willis of Kewpy’s CKCS. When Basty looks at me, he does so with pure adoration. His gaze would melt the heart of an ice man. He depends on me for all. He has a pure heart, that could not bring harm to another soul, be it canine, feline, rabbit, bird, or any other. When my Niece Jen convinced me I needed a dog, I decided the time was right. I searched the internet for possible breeds. 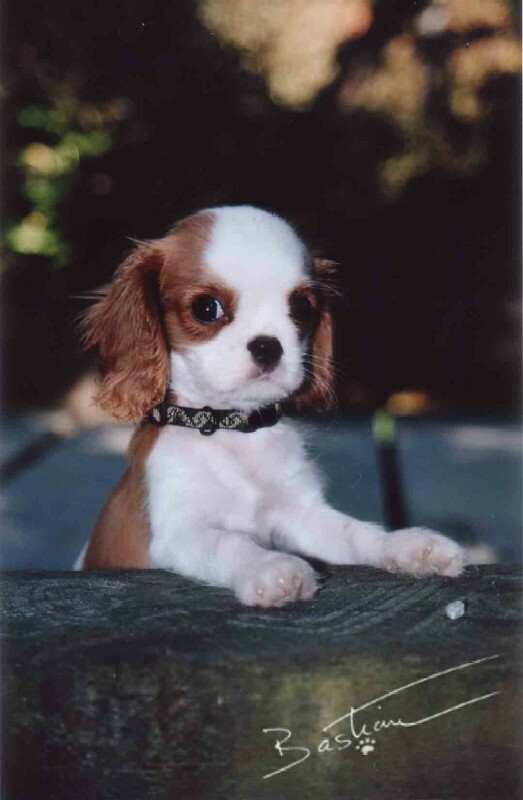 I found a site that listed breeds from A to Z. I got as far as the letter C for Cavalier. The description of the breed seemed to fit my personality. It wasn’t long before I found a breeder, and the rest is history. This is a blog about how Basty has taken control of my life, and how I have become a better person through his influence.